The process of reporting casting rumors is an odd one, and it's taken quite a turn in the last 48 hours with Marvel's Doctor Strange, a film to which noted news and rumor site Latino Review attached Johnny Depp earlier this week, only to have that almost immediately denied by reps for both the studio and the actor--and further news that the script may not even be ready to go anymore, with major rewrites expected. Now, This Is Infamous is claiming that Mad Men star Jon Hamm has been cast as Marvel's Sorcerer Supreme. That's right--"has been cast." Past tense. The weird thing? That's what we've heard, too. We've now had two different sources tell us that the ink is already dry on a deal with Hamm, with one saying that he has, in fact, been in line for the gig for about a year. As we reported yesterday, Doctor Strange is seen as a lynchpin property that can link a number of disparate films, and Marvel is keen to make sure it's done right--which makes sense, given the fact that they will lose Robert Downey, Jr.'s iconic representation of Iron Man after Avengers 3 and have no new Iron Man solo films planned for the star. How this might be impacted by reportedly major rewrites on the script is up in the air. If a contract was signed with a middle-aged actor with the idea that he would be starting to appear in 2016, a delay on getting him to the screen might cause the studio to reevaluate, especially if the character were going to be a recurring character in one or more franchises. 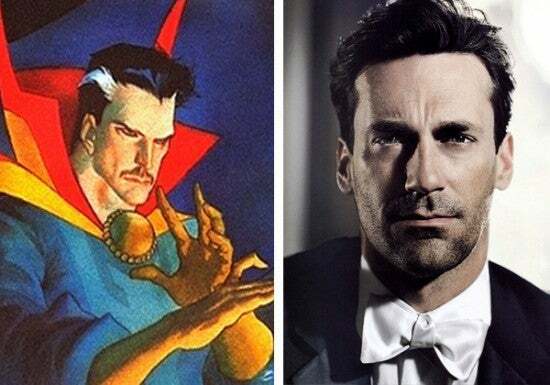 The report, though, seems to indicate that Hamm's Strange would take the place of Robert Downey, Jr.'s Iron Man as the centerpiece of the Marvel Cinematic Universe (also something we've heard), and so having someone cast who is pretty close in age to where Downey was when he started may not be as big a liability as it seems at first.